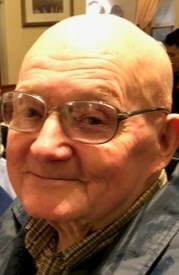 James D. Blackburn, age 83, of Hockessin, DE, peacefully passed away on November 29, 2018, surrounded by his family. Born in McAndrews, Kentucky in 1935, he was the son of the late Texie Ella and James H. Blackburn. Jim attended Conrad High School and retired from Delmarva Power Co. after proudly serving 41 years of dedication. He found a passion for coaching Piedmont Little League when his children were young and enjoyed it for 15 years. Jim loved camping with his family. They traveled with four camping clubs, enjoying a close-knit group of camping friends for 41 years. He liked to bowl and later added golfing as well. Jim absolutely loved going out for dinner, especially buffets. In his retirement, the Outer Banks became his favorite vacation retreat. For many years, Jim has been an active member of the Community Christ Church. Survived by his wife of 60 years, Rebecca Foskey Blackburn, three children Ronnie D. of Dover, Jerry L. of Hockessin, Brenda L. and her significant other Donna S. of Hockessin, sister Cora Durgain of Wilmington, sister-in-law Susan Gunzel and her family of Canada, brother-in-law John Foskey of Wilmington and his family, as well as many beloved nieces and nephews. In addition to his parents, Jim is predeceased by his sisters Iva Hastings and Goldie Nemedi. Wednesday December 5, 2018 at 11:00AM at Community of Christ Church, 1205 Milltown Rd., Wilmington, DE. His viewing will be held on Tuesday December 4 from 6:00-8:00PM at Chandler Funeral Home, 7230 Lancaster Pike, Hockessin, DE and again on Wednesday at the Church from 10:00-11:00AM. Interment will be at Gracelawn Memorial Park. Dad, I will miss you until we meet again at the big buffet in Heaven. I will always remember you in my heart, but there will be a big hole. Love you always, Dad. Uncle Jim, I may call you Uncle, but for the time I was blessed to have lived with you, you were my Dad. I love you so much. Deepest sympathy to your family. Although I had not known Jim very long, he always made you feel like you were part of the family. He will be missed by his family & friends. Rest in Peace Jim. Sorry, for your families loss. He was a great man. Loved his advice in softball! Pop we loved u and picture you sitting behind the backstop in heaven watching a game. Will keep you and memories in our hearts.